My Monday Comments: All my clients, at least those who haven’t left me for greener pastures, are all concerned about the future of their money. Like me, most of them are going to need their money to pay bills as their years unfold. Losing a big percentage in a market crash makes us nervous. In my files I have an article dated July 30, 2016 by Jeffrey Gundlach where he yells “SELL EVERYTHING”. In retrospect that would have been a terrible idea. But the headline above still resonates since we know it’s coming sooner or later. This is long and a little technical so if you are not inclined to worry about it much, you can stop here. On the other hand if you want to explore further, be my guest. It’s been a decade since the Great Recession, so the obvious question that is now on many people’s minds is “when is the next recession and bear market”? As someone who is warning about a dangerous stock market bubble, I am asked this question quite frequently. Unfortunately, it is impossible to predict the timing of future economic events with a high level of detail and accuracy such as “the market will top on April 17th, 2019” or “the recession will begin in August 2020”, but there are certain tools that help to estimate where we are in the economic cycle. In this piece, I will discuss the U.S. Treasury yield spread and yield curve and how it is useful for estimating the approximate time frame when the next recession and bear market may occur. 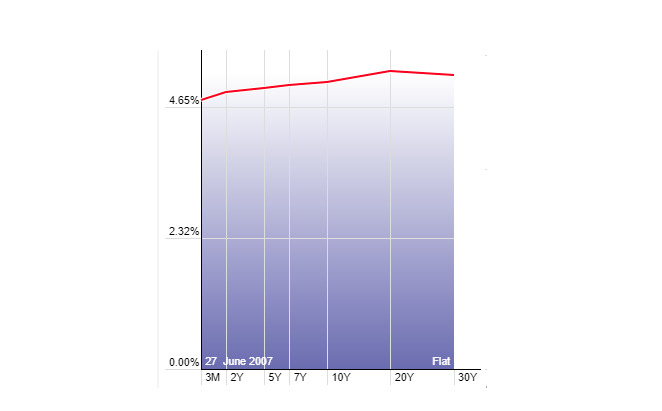 Let’s start with a quick explanation of the Treasury bond yield curve: in a normal interest rate environment, bonds with shorter maturities have lower yields, while bonds with longer maturities have higher yields to compensate for the greater risk incurred when holding for a longer period of time (primarily default and inflation risk). 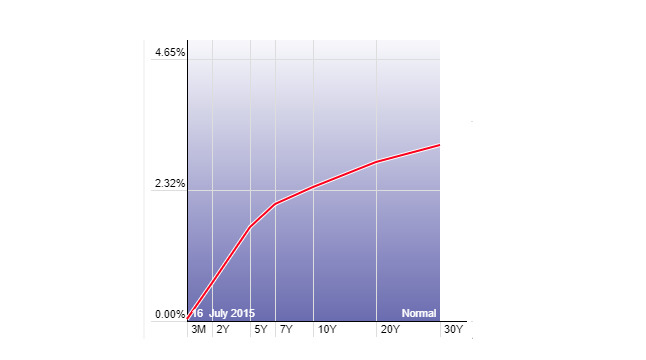 The chart below shows an example of a normal yield curve. A normal yield curve takes shape early on in the economic cycle and lasts for the majority of the cycle. A normal yield curve is usually a sign that the bull market in stocks has further to run. As an economic cycle matures and the Federal Reserve has raised interest rates quite a few times, the yield curve flattens (see the chart below for an example). The Fed controls the short end of the yield curve, and their succession of rate hikes causes the short end to catch up with the longer end. A flat yield curve is a signal to investors that the bull market is “middle aged” – no longer young, but not quite ready to die just yet.